Do you ever stop to think about the products you are using on your skin? I always do and have tried to make a shift in the products I buy for myself and my family. I was recently introduced to a new line of organic products called Maple Organics. 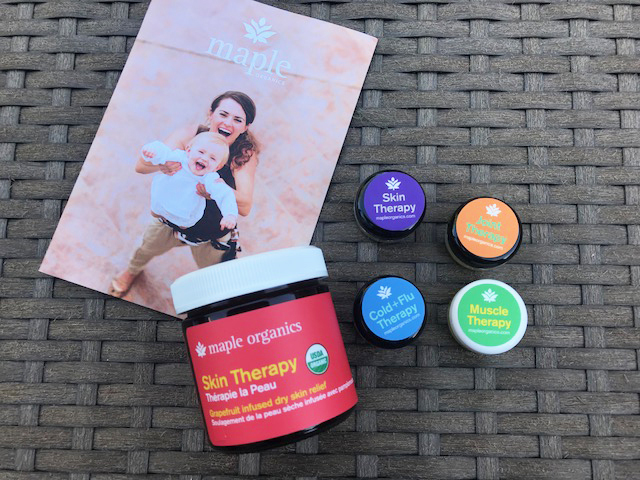 Maple Organics products are developed and created by a Canadian mom who worked closely with Health Canada and a chemist to produce safe products for the entire family. They are Canada’s first Organic’s Pharmaceutical Company. Baby and personal care products combine a unique maple extract with kokum butter. Maple Organics products are licensed by Health Canada. Maple Organics products carry the USDA seal of approval. Maple Organic’s Skin Therapy helps nourish skin and is their best selling product. It helps to improve dry and cracked skin and relieve mild eczema. Ingredients: Olea Europaea, Cocos Nucifera, Euphorbia Anisyphilitica, Butyrospermun Parkii, Garcinia Indica, Elaesis Guineesis, Simmondsia Chinensis, Rosa Mosqueta, Tocopherol, Rosmarinus Officinalis, Oleoresin, Azadirachita Indica, Acer Saccharinum Extract in Olea Europaea, Lavandula Officinalis. Maple Organic’s Joint Therapy helps alleviate symptoms related to stiff joints, inflammation and soreness. Apply this safe product morning and night as needed. Ingredients: Olea Europaea, Cocos Nucifera, Euphorbia Anisyphilitica, Butyrospermun Parkii, Garcinia Indica, Elaesis guineesis, Simmondsia Chinensis, Rosa Mosqueta, Tocopherol, Rosmarinus Officinalis, Oleoresin, Azadirachita Indica, Acer Saccharinum Extract in Olea Europaea, Lavandula Officinalis, Arnica Montana, Cinnamomum Camphora, Melaluca Cajeputi, Eucayptus Globulus. This product will help soothe muscle soreness and tightness. Muscle Therapy offers a warming sensation when applied. Ingredients: Olea Europaea, Cocos Nucifera, Euphorbia Anisyphilitica, Butyrospermun Parkii, Garcinia Indica, Elaesis Guineesis, Simmondsia Chinensis, Rosa Mosqueta, Tocopherol, Rosmarinus Officinalis, Oleoresin, Azadirachita Indica, Acer Saccharinum Extract in Olea Europaea, Lavandula Officinalis, Gaultheria Procumbens, Cinnamomum Camphora, Melaluca Cajeputi, Eucayptus Globulus. 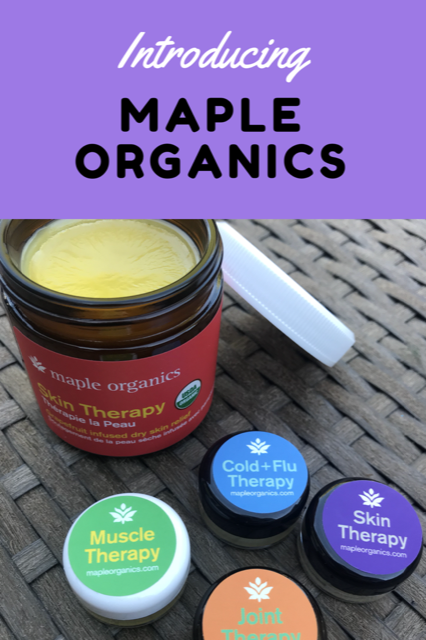 Maple Organic’s Cold and Flu Vapour Rub Therapy is similar to other products on the market but does not use harmful ingredients for your body. This product will help relieve the symptoms of cold and flu such as congestion, stuffy nose, sinus pressure and coughing so that you can rest easier day and night. Ingredients: Olea Europaea, Cocos Nucifera, Euphorbia Anisyphilitica, Butyrospermun Parkii, Garcinia Indica, Elaesis Guineesis, Simmondsia Chinensis, Romarinus Officinalis, Oleoresin, Azadirachta Indica, Acer Saccharinum Extract in Olea Europaea, Lavendula Officinalis, Menthol, Cinnamomum Camphora, Melaluleuca Cajeputi, Eucalyptus Globulus. This summer, Maple Organics has released a limited edition Skin Therapy Grapefruit infused dry skin relief salve. This hand salve has the same safe ingredients as the original Skin Therapy but has a nice light grapefruit scent. I’ve been so happy with the Maple Organics products that I’ve tried. The skin therapy has done wonders for my dry feet and my daughter’s eczema. I absolutely trust these products and am so proud to be supporting a Canadian business. I try to purchase as many organic body products as possible. I like the peace of mind that natural and organic products give me. I highly recommend you try Maple Organics products. You can purchase Maple Organics products online or through one of their representatives. The team at Maple Organics wants you to experience how wonderful their Skin Therapy is. They are giving away a limited edition Grapefruit Skin Therapy and samples of all their top sellers to one lucky ready. To enter, tell me which Maple Organics product you are most interested in trying and why. Then fill out the Rafflecopter form below. Giveaway open to Canadian residents. Mandatory question must be answered to be eligible to win. Giveaway runs from July 17 to July 25, 2018. See my terms & conditions for full giveaway details. Void where prohibited. These sound like great products and I love that it’s a Canadian firm. I have not tried these yet. the cold and flu therapy! The personal care line,because I would like it for my skin. I would like to try the Organic Cold and Flu Vapour Rub Therapy. It would come in handy in our house during cold & flu season. I would like to try the Organic Joint Therapy and Muscle Therapy after having Chemo every part of my body hurts. I would like to try the joint therapy with all my fractures my joints get really sore at times. I’d like to try the cold and flu therapy. 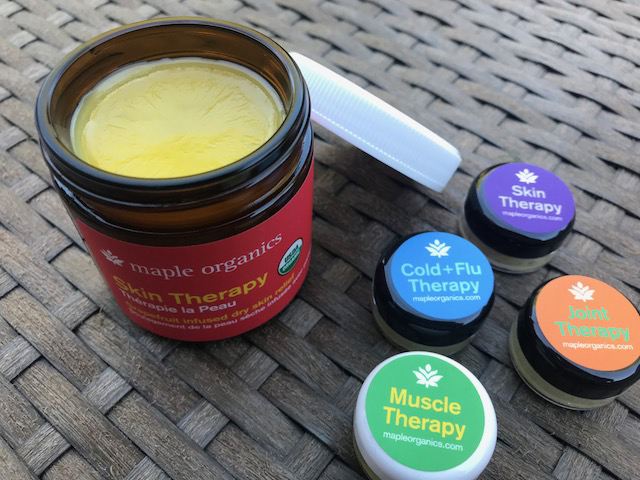 I would love to try the Organic Cold and Flu Vapour Rub Therapy because I hope that it would help my family during flu season instead of using conventional products that are made with chemicals. I would like to try the Organic Skin Therapy because I have very dry skin. I’d like to try the Organic Muscle Therapy because I get sore muscles and muscle tightness frequently. I would love to try the organic skin therapy. I have very dry skin and have tried a lot of different products over the years…..still looking….. I would love to try the Organic Skin Therapy as hubby and I both have skin problems! I would love to try the Muscle Therapy as I often get achy from working out and my physical job! 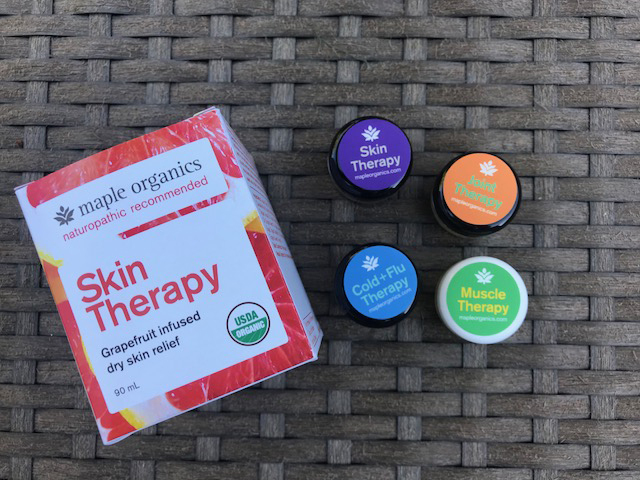 I’m most excited to try Maple Organic’s Skin Therapy! I would love to try the skin therapy because I have dry feet and cracking heels!! I would love to try the Organic Joint Therapy to see if it would help with stiff and swollen joints that come with ageing. I would love to try the muscle therapy for my sore muscles. My spouse experiences the same thing. Thanks! I would like to try the Cold and Flu Therapy because I haven’t found any treatment that works well. I would love to try the Joint Therapy! I would love to try the Cold and Flu Rub. Thanks for the chance! I would like to try the Muscle Therapy! I always have muscle pain! I would love to try their Muscle Therapy after gardening aches and pains. Ohhh the muscle therapy – I’m starting to run again so I need it! I would love the muscle therapy as I get so many migraines with ties up muscles!!!! I love not only, Canadian, and organic but that their entire product is certified organic. SO impressive!! I would love to try the Cold and Flu Vapour Rub Therapy as I find other brands too harsh. I would love to try the skin therapy as i have eczema! I get leg cramps at night and I really want to try the Muscle Therapy. It sounds wonderful! I’d love to try the Organic Skin Therapy on my toddler’s legs as there is a bit of eczema there. Thanks for the chance! I would love to try the Cold & Flu rub, Skin Therapy and Joint Therapy, they all sound amazing. I look forward to trying the Organic Skin Therapy to help my dry heels. Could also use the Cold & Flu rub and the Skin Therapy. I would like to try the Muscle Therapy as I have muscle pain. I would especially like to try the cold & flu treatment. When you as sick and achy it’s hard to take meds so I think this would be soothing. I would love to try the Organic Joint Therapy!